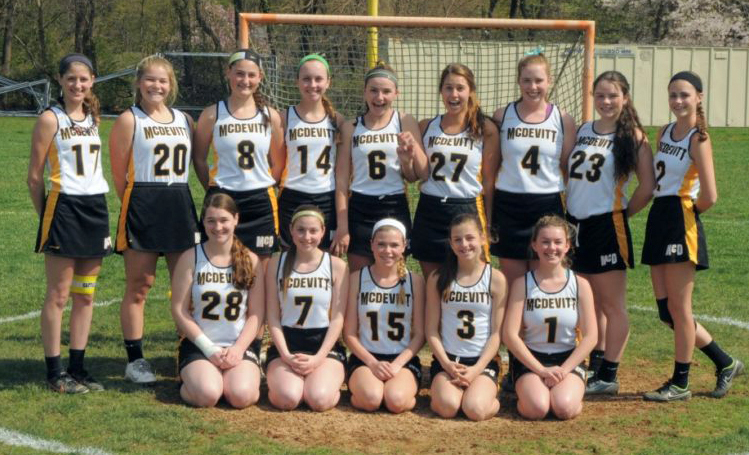 The Bishop McDevitt High School lacrosse team, with star scorer Suzanna Cantwell, no. 3, at second from right, front row. Bishop McDevitt High School has made history. That is because senior Suzanna Cantwell of the girls’ lacrosse team has become the first player in school history to secure her 200th career goal. McDevitt head coach Megan MacClain, who took over as head coach last year after serving as assistant the previous two years, has worked with Cantwell these past four years and watched her grow each season. As a sophomore, Cantwell achieved an important milestone. During a McDevitt game against Little Flower two years ago she scored her 100th high school career goal. Had she achieved no more milestones in her time at McDevitt, she would have been satisfied. Two years later, however, Cantwell accomplished a whole lot more. When McDevitt took on Bonner-Prendergast May 1 in Catholic League play, she tallied seven goals extending her four-year total to 196. The excitement kept building for her, the team and the McDevitt school community knowing that the 200 mark was likely to be reached any day. The very next day, in a nonleague match against Lower Moreland, Cantwell exceeded that mark as she added six goals despite her team falling by a narrow score of 11-10. McDevitt concluded its 2018 season with a final record of 4-10. While the team fell just one win short of the playoffs the last two years, this year it had to compete with only five players who had any lacrosse experience at all. As a result, Cantwell stepped to the forefront as a role model. Her athletic talent goes beyond lacrosse. She has also played soccer in all four of her years at McDevitt as well as basketball as a freshman and sophomore. Through it all she has learned to balance her time between academics and athletics, since practices don’t usually end until 5:15 in the evening and coming home from away games can be much later. “It’s about staying on top of my work and not getting behind,” she said. With Cantwell graduating in just a few weeks, she is leaving behind shoes for Bishop McDevitt to fill next season. “She will definitely be a missed player next year,” said MacClain. What will Cantwell’s next challenge be? She is headed to the University of Hartford where she will continue her lacrosse career at the collegiate level. She intends initially to major in physical therapy but hopes eventually to move on to occupational therapy.